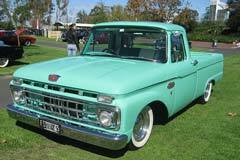 The Ford F-100 trucks were made from 1961 to 1966. This was the fourth generation of the Ford F-Series which was a popular line of not only pickup trucks, but also commercial trucks. The F-100 was wider and lower than its predecessor. This series introduced the new “unibody” trucks which had integrated the cab with the box into one single body. The F-100 trucks weighted a half ton. The “unibody” styled trucks were dropped from the line by 1964. The 1963-66 models looked very much the same except the 1963-1964 models have turn signals that are horizontal with the headlights, while the 1965-1966 models have turn signals that are above the truck's headlights. The 1965 F-100 received a new chassis but still had the same body. The 1965-1966 F-100 trucks were made with a new front suspension, the Twin I-Beam. The new four door crew-cab models were also available in 1965. The 300-cubic inch straight-six engine was also introduced in 1965. It had seven main bearings, as well as timing gears without any belts or chains. This engine would stay in the F-Series line until 1996. The Ranger model first appeared in 1965, and it was a new styling package that had bucket seats. 1966 Ford F-100 Style Side Short Bed Restored Original Fresh Restoration F100 Original #'S Match . Straight , Solid . Short Bed !